For some, it is said, wisdom comes with age; for others, age comes by itself. Yet there’s one thing almost everyone can count on when they reach early adulthood: the arrival of the third molars, commonly known as “wisdom teeth.” This set of teeth (generally four, but sometimes more or less) most often appears between the ages of 18 and 24 years. They are the farthest back in the jaw and the last to come in, completing the process of dental development that began in infancy. Unfortunately, the appearance of wisdom teeth may be accompanied by dental problems. Trouble is more likely to occur when the teeth are impacted—that is, they are developing in a way that makes it impossible for them to erupt (emerge from under the gums) and take their expected places in the jaw without affecting nearby healthy teeth. Impacted teeth generally result from one or more of the following: a lack of sufficient space in the jaw (crowding); an obstruction (such as another tooth in the way); or an abnormal position in the mouth. It’s not certain how many people are affected by this issue, but one recent study recently cited in the journal BMJ Clinical Evidence showed that 7 in 10 people aged 20-30 had at least one impacted wisdom tooth. Frequently, the solution to potential problems with impacted wisdom teeth is removal (extraction)—even before symptoms are noticed. In fact, this is one of the most common procedures performed by oral and maxillofacial (“maxilla” – jaw; “facial” – face) surgeons today. Yet many people have questions about when—or if—this surgical procedure is needed. For example, if a wisdom tooth isn’t causing pain or disease now but might create problems later, should it be removed as a preventive measure? Let’s take a closer look at what’s involved in making these decisions. Why does our body develop these extra teeth in the first place, if they cause so many problems? Many scientists believe that the third set of molars helped our early ancestors consume the tough, raw foods that were a big part of their diet. As the human diet became softer, jaw size gradually decreased and those teeth were no longer needed. Yet they still develop beneath the gum tissue, and have the potential to cause trouble. Periodontal (gum) disease is among the most common problems associated with impacted wisdom teeth. The emergence of these molars can disrupt the attachment of gum tissue to nearby teeth, making them more susceptible to bacterial infection. If they get too close to an adjacent tooth’s roots, they can damage and eventually cause the body to resorb (break down) those roots. Impacted third molars may also become cystic (surrounded by a fluid-filled sac); if infection develops, this can lead to a painful abscess that can harm the surrounding teeth, bone and soft tissues. 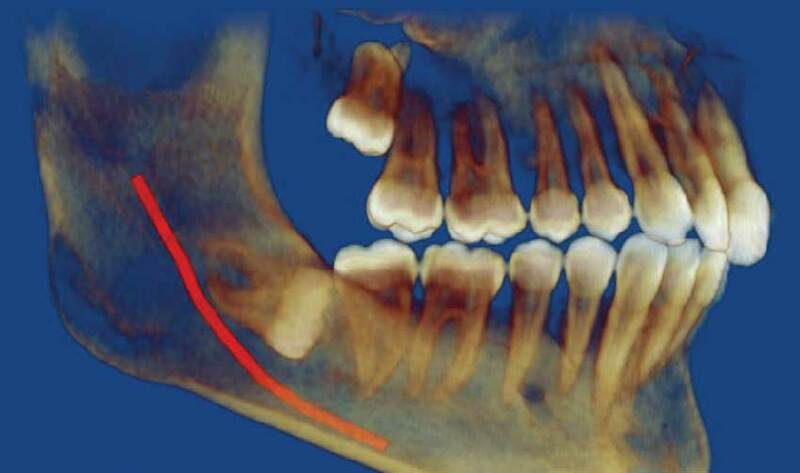 This CT scan reveals that the wisdom tooth on top is slightly tilted toward the rear of the mouth; the one on the bottom is almost horizontal and too close to the nerve (red line). 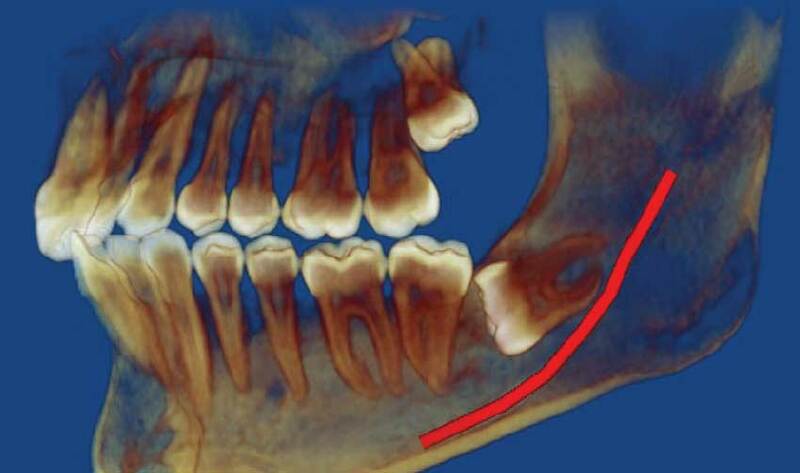 Here, the lower wisdom tooth is tilted toward the center of the mouth, while the upper one is pushing against the roots of the second molar. 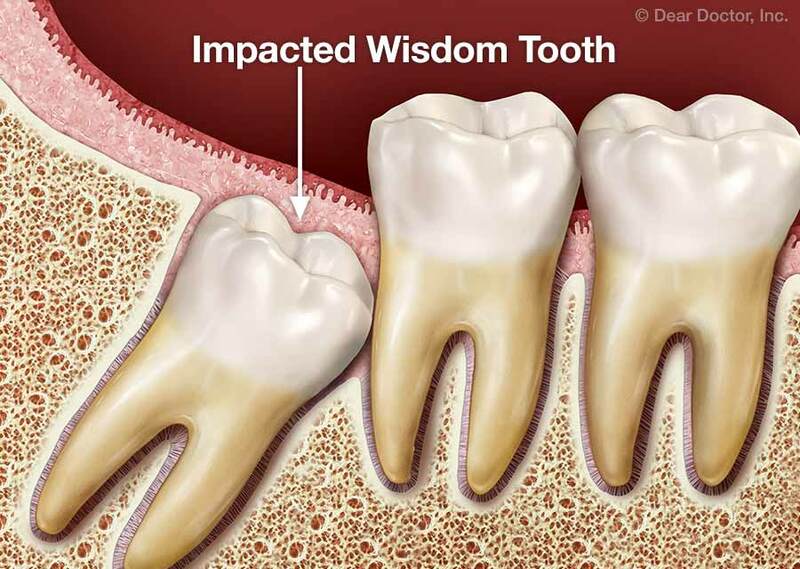 When a wisdom tooth is horizontally impacted, like the one on the bottom, periodontal disease often results. This can damage the adjacent molar. However, just because wisdom teeth may cause trouble doesn’t mean they will—and that goes to the heart of the issue. If we could see into the future and predict whether an individual’s developing third molars would lead to dental problems, we would treat them promptly. Unfortunately, we can’t reliably predict what will happen when they erupt. While it’s possible to visualize developing wisdom teeth with x-rays and CT scans, these imaging techniques generally don’t tell us what the outcome will be. In fact, researchers have found that about one in three wisdom teeth that initially show no signs of trouble will change position in time, and end up causing problems later. 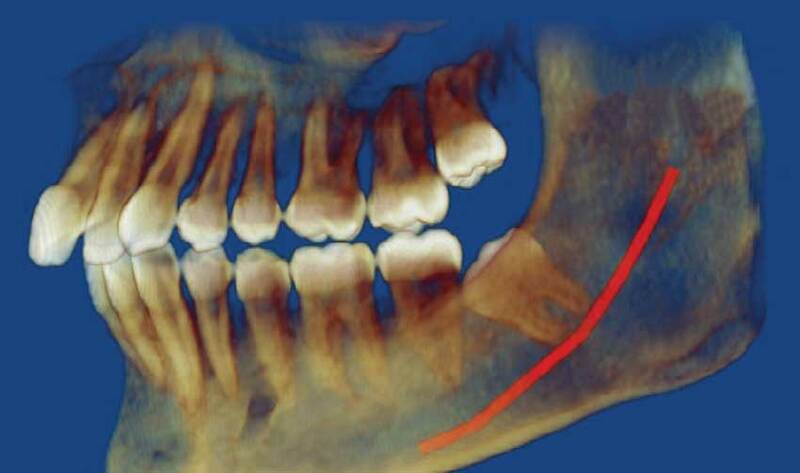 So how do we make wise decisions about treating these teeth? I have found it helpful to group wisdom teeth into four categories based on whether they show evidence of disease, and whether they are producing noticeable symptoms. The chart above shows four possible categories, which are labeled I through IV. After a dental examination, an individual’s wisdom tooth can be assigned to one of these four categories; this helps place it in context and suggests appropriate treatment alternatives. Wisdom teeth in category I, where both symptoms and disease are present, are fairly common and easy to recognize. People in this situation may experience pain, swelling, a foul taste or difficulty opening the mouth. Dentists frequently find infections, decay and/or periodontal disease that requires prompt treatment. Depending on the exact circumstances, treatment may include tooth restoration, periodontal care, or extraction. Third molars in category II, where symptoms are present but no disease is found, are far less common. Here, people may experience vague pain in the back of the mouth or other unusual symptoms, but an examination fails to find clear signs of disease. When the source of the symptoms is uncertain, the dentist may refer the patient for further evaluation and discuss the benefits, drawbacks and alternatives to extraction. Teeth in category III aren’t yet producing noticeable symptoms; however, examination shows a “silent” type of disease is present. This could be tooth decay, gum disease, even a developing cyst or tumor. Like group I teeth, appropriate treatment based on the diagnosis is needed. Finally, there are the teeth in category IV. These teeth are currently producing no symptoms and showing no signs of disease. It’s important to remember that just because a tooth is impacted doesn’t mean it is diseased. However, over time, some impacted teeth will develop diseases. Because there’s no clear-cut way to choose the best course of action in this case, your dentist’s experience with similar clinical situations and your own preferences will be major factors in your treatment recommendations. That’s why it is important for you to become as informed as possible about your options. Wisdom teeth that are diseased, or are likely to become diseased, can benefit from treatment even if no symptoms are present at the time. When left untreated, dental disease can quickly progress into a serious situation. Untreated decay can cause an infection in the soft tissue inside the tooth’s root canal. Over time, this may allow harmful bacteria to pass through the tooth root and into the jaw, potentially causing a painful abscess to form beneath the gum. Periodontal disease that isn’t treated can cause teeth to loosen and eventually fall out. Not having enough space in the jaw often leads to crowding when wisdom teeth emerge; this can cause problems for your oral health as well as cosmetic issues. Any of these issues can cause problems with chewing, speaking, and other activities. They may also be painful, and often require time off from school or work to resolve. Because impacted wisdom teeth are so widespread, it was (and still remains) a common practice to remove them as a routine preventive measure, whether diseased or not. However, a recent systematic review of research studies found no evidence to support—or refute—the routine removal of symptom-free wisdom teeth. This has led some to question the customary policy, citing the costs and potential complications of oral surgery, which are similar to those of any minor surgical procedure. There is no question that it’s best to avoid unnecessary surgery. However, it is impossible to predict whether wisdom teeth that are problem-free now will stay that way in the future. That means that many people who choose not to be treated aren’t avoiding surgery—they may be simply postponing it. Furthermore, there is evidence that having the surgery done at an earlier rather than later age can lead to a better overall outcome with fewer complications. If my third molars need to be removed, when is the best time to do it? Patients who elect to retain their wisdom teeth should be managed with a strategy called active surveillance. People who opt for this method may still end up having their wisdom teeth removed in the future…but not until there is clearer evidence of trouble. The goal of active surveillance is to discover and treat problems as early as possible—preferably before symptoms become apparent. I recommend that people who choose this strategy be carefully examined every 24 months for any issues related to their wisdom teeth. When wisdom teeth are causing problems for your oral health, the decision to remove them shouldn’t be difficult to make. Oral surgeons extract around 10 million wisdom teeth each year in the U.S. alone. The procedure is typically performed in a dental specialist’s office, using the type of anesthesia that’s best for you. Afterwards, recovery generally involves a few days of rest, with prescription or over-the-counter medications to control pain. Intermittent ice packs (5 minutes on and 5 minutes off) and warm salt water rinses the day after surgery may also be recommended to ease swelling and discomfort. But when impacted wisdom teeth aren’t causing symptoms and don’t show signs of disease, extraction may not be the only alternative. In these situations, it’s best to talk to your dentist and carefully review the potential risks and benefits of all your options. His or her experience with clinical situations similar to yours will be a significant factor in the decision-making process. Your own preferences will also carry considerable weight. Ultimately, this important conversation can help lead you to the best outcome in your own unique situation.